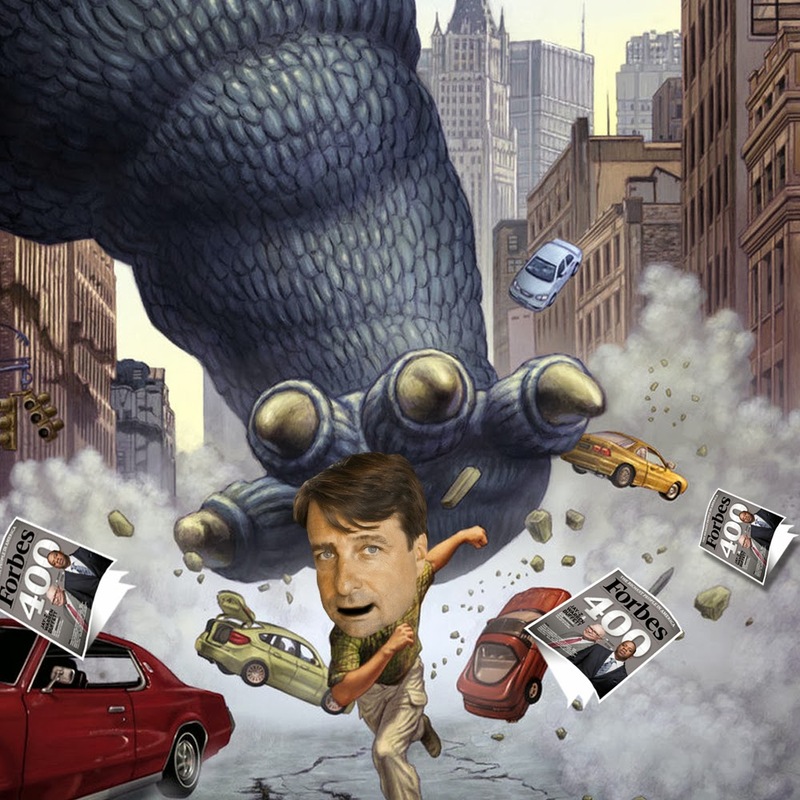 Kaiju News | Everything Kaiju: Forbes Columnist Stomps on Godzilla 2014, G-Fans Stomp Back! 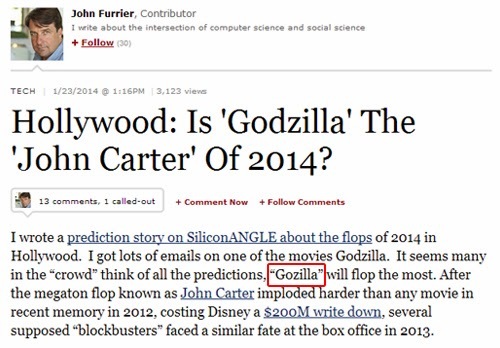 Forbes Columnist Stomps on Godzilla 2014, G-Fans Stomp Back! Them are fightin' words! In a column titled "Hollywood: Is 'Godzilla' The 'John Carter' Of 2014?" John Furrier picks three movies he think will flop based on incomplete earnings information and poor definitions of a "box-office bomb". King Kong and Pacific Rim did quite well world wide. But he makes his arguments, and the best part is G-fans push back in the comments. read what he as to say about gareth edwards Godzilla 2014 specifically followed by comments from G-fans. He can't even spell Godzilla right, unless he meant Gojira, which he still screwed up. He put it in quotes, so he was trying something. Gojira? (#1 To Fop) Godzilla. Hands down, “Godzilla” will be the biggest box office bomb of 2014. Godzilla as a character is box office poison. The fact is the last 3 Godzilla movies released domestically have flopped: “Godzilla 1985” made $4M; “Godzilla 2000” made a whopping $10M and the last attempt at a Hollywood-style big budget remake, also called “Godzilla” bombed so bad that its lead toy licensee went bankrupt. Had the movie made a profit the studio wouldn’t have just let the rights expire in 2003 without even attempting a reboot or sequel. They had 5 years to make a new film based on this property yet they passed. Think about it—Sony, the studio that greenlights sequels to most anything—”Resident Evil 6″ is on the horizon and don’t forget about “Underworld 5″—walked away from investing another cent in Godzilla. Aside from Godzilla, the giant monster genre as a whole is anemic. “King Kong” flopped, despite having Peter Jackson at the helm; “Pacific Rim” bombed, despite having umpteen giant monsters battling on screen; “Gamera the Brave,” about a lumbering giant turtle monster, delivered weak numbers at the box office; and if you go to the outer edges of the giant monster genre, recent films like “Jack the Giant Slayer” bombed and “Walking with Dinosaurs” flopped as well. This is the best part, when the fans push back. You must have an interesting definition of the words “flop” and “bomb” considering Pacific Rim and King Kong both pulled in around half a billion worldwide. Hate how freely those words are tossed around. Godzilla will surprise many, easily beat budget and be a sleeper smash. Count it. I’m sorry but what? The Hollywood version of Godzilla was made on a budget of 130 mil and made over 350 million dollars (which by today’s standards is a lot more), so I fail to see the “bombing so hard” in that. Plus Godzilla Final Wars had a high budget and was only shown in the Asian market, of course it wasn’t going to succeed. Get your facts right next time. you apparently have only payed attention to people having no faith. Godzilla was one of the most popular things at comic-con. You also should pay more attention to the cast and crew who praise the films. you also have neglected mentioning the original’s success. You also haven’t mentioned any viral campaign’s. It doesn’t need to make the most money to be a good movie. I’m going to come back to this article in 4 months and call you a retard. The fact that all of these comments are towards Godzilla and not the other movies should also tell you that you could not be any more wrong. Notice that he did not mentioned how much money the 1998 American film made at the box office. and Godzilla 1985 and 2000 were only theatrically release in just the US not world wide. this new film is being released world wide. so don’t take peoples words guys when they only done half of search. Speaking of monster movies, you did not mention Cloverfield, which had a budget of 25 million and made 40 million on its opening weekend already. And that was just in North America. Worldwide it grossed approximately 100 million dollars, the first movie in 2008 to reach that mark. That doesn’t sound like a flop to me. The biggest problem previous Godzilla films had is the studios never took the subject matter seriously. while Cloverfield divided Kaiju audiences, it did provide a more serious take on the material that shows that when done right, giant monster movies can pay off ( budget $25 million – made $170 million + ). And of course I had to chime in too. John, I’m not sure you understand marketing 101. If you have a crappy product, your going to get crappy sales. Even worse, I don’t think you have done your homework. A few of your examples “flopped” because they were not good products; Green Lantern, 47 Ronin, and After Earth all scored low on Rotten Tomatoes: 26%, 13%, and 11% respectively. And as Christian Stump mentioned King Kong and Pacific Rim did very well world-wide, which is the market studios care about (they both also scored well on the tomatometer 84% and 71%). I hope on the weekend of May 16th, when Godzilla 2014 comes out, you will remind us how wrong you were about this article. And how wrong you were about Godzilla. Please comment below and tell us why you think John furrier is wrong. Promotions for Godzilla Have Been Going On For The Past Two Years Now Through Comi-Con, The Viral Sites, And Of Course The Internet. How Could You Be So Naive And Claim That Godzilla Is Doomed To Be A "Flop" When You Don't Even Have All The Facts Most Recent Kaiju Related Films (Cloverfield, Pacific Rim, And King Kong)!? I Have Been Looking Forward To ThIs Film Since The Day I Heard That Legendary Bought The Rights To Produce This Film And Stated That The Film Will Be Released In 2014. The Teaser Trailer That Was Just Released Had Over 9 MILLION... Views Its First Day. 13 Million Views Later And To Me Its Going To Be Epic. I Know You Are Wrong And I Know That This Film Will Be An Instant Classic. The worse part is his own arguments work against him. You can't compare this Godzilla to the Roland Emerick one. AND, he doesn't have all the data for box office sales. Plus, as you point out, the trailer popularity is off the charts. Thx for your comment Michael! The US Godzilla Takes Manhattan movie suffered from bad attempts at cleverness, such as thinking that viewers wanted to see raptor-like babies over the big guy (or gal, in that case). As much as I liked "Final Wars", I can see it suffering from people thinking it was a little too much like Godzilla meets The Power Rangers. Cloverfield was barely a kaiju movie, as the monster appeared about as much as the Blair Witch did. Another movie, Monsters, seemed like someone's idea of a kaiju movie for the Cannes or Sundance audience. Pacific Rim gave viewers pretty much what they wanted--giant monsters and mechs duking it out. What I've seen about the upcoming Godzilla movie makes me think they've done things right in making it, too. Of course, the proof will be in the viewing, but so far, it seems like it's a movie they took seriously in making it. If so, I would guess it's popular may be pretty high. The should be "popularity" in that last sentence. Someday, I might learn to akchyouahlee spell. Great point Jazzact13, The sensibilities of the creators of Godzilla 2014, seem more aware of what fans expect out of a Godzilla movie. Thx for the comment!